This large greenfield Adelaide and surrounds territory is available for $49,500.00 + new or second hand vehicle. This also includes all equipment and materials including a custom stainless-steel fit out of your van, training, travel and accomodation during your training, legal fees, WH&S manuals, complete uniform package, administration fees and your initial franchise fee. Owning a Superfinish Express franchise means that you don't need to worry about chasing customers for payment, we take care of your accounts receivable and pay you each week. The only book keeping you are required to do is your quarterly BAS statement and annual tax return. No more late nights chasing overdue invoices, we do it all. Superfinish Express is the only mobile repair franchise that gives you a regular payment every week. Once you have completed the repair work, you invoice your customers through the E-Billing system and you will get paid at the end of each trading week. Superfinish Express also provides you with income support of $1000 per week for the first five weeks following the successful completion of your initial technical training, so that you can focus on the running of your business. *Performance conditions apply. No previous painting or related industry experience is required. We provide you with full training, covering all aspects of the business from the technical processes, right through to customer service. Superfinish Express franchisees work exclusively with trade customers, including new and used motor dealerships, fleets, hire cars, auction houses etc. 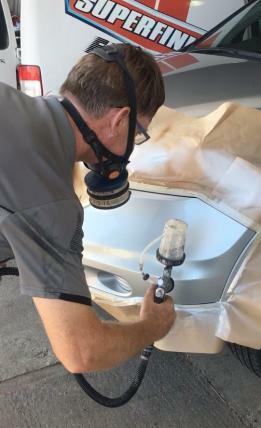 Trade customers are repeat customers providing consistent and quality cosmetic repair work all year round, regardless of the prevailing retail economic conditions. Our product distribution centre is fully stocked with all of the products and equipment you will need, ordering is fast and easy through the E-billing system and orders are usually shipped same day. Superfinish Express is committed to providing on-going technical and business support to keep franchisees up to date with the latest repair techniques and products; and to enable franchisees to discuss and share experiences. Technical help is available over the phone 5 days a week. Superfinish Express has over 20 years experience teaching people just like you to be successful business owners. The Superfinish Express family is always growing, and we would be thrilled if it included you. Truck business in Wingfield ( Negotiable Negotiable) - Truck Repair Buisness . If you are looking to sell your Bike and Automotive or Spray Painting business for sale, or business for sale in South Australia (SA), Australian Business for Sale has variety of packages to choose from. Click here to read How to Sell A Business Online. Click to see shops in Australia.